And I'm totally excited about it. You know the whole barefoot running craze? Of course you do. So probably you already know the arguments, about how it's more "natural" for runners to be fore/midfoot strikers, but modern running shoes pad the back of the shoe and force us to heel strike. Knowing that, you likely already know the arguments: that you have to ease into barefoot running, and that it's not for everyone. I want to jump this bandwagon, because I'm the sort of person that follows trends. Sad but true: I took my mom and lined up to get the last Harry Potter book at Barnes and Noble at midnight on release day. 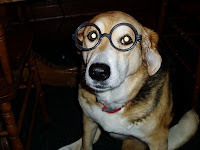 We dressed her dog up in HP glasses. Not because I wanted the book, but because I wanted to be part of the spectacle. I was, you know, in my mid-late 20s at the time. I want to jump this barefoot bandwagon because, in theory, it makes sense. I read Born to Run; I bought into it. However, you could argue, it also makes sense that I'm not a runner who genetically is fit for this trend. One thing is certain: no chia seeds for me. Not yet, anyway. Never say never. But, back to my stupid thing. I ordered a pair of running shoes, without trying them on, from Sierra Trading Post. They were $30, and I recognized them from last month's Runner's World shoe guide: the Karhu Forward Fulcrum Ride. Magic shoes that will take my speedwork to new levels via technology that will tip me onto my forefoot whether I want to be there or not. And on the cheap! And I do love all things Scandinavian. A dog wearing glasses looks exactly as dumb as you'd expect, no? At least we spared her the lightning bolt tattoo.